Singapore company registration specialist Rikvin has today made its Singapore Corporate Tax Calculator available on its website. The tool, which is free and the first of its kind in Singapore, has been designed specially for entrepreneurs and locally-registered firms that wish to estimate their effective corporate tax rates for YA 2013. The easy-to-use tool calculates a firm’s net payable corporate taxes based on its chargeable income generated during the basis period of 1 January 2012 to 31 December 2012. 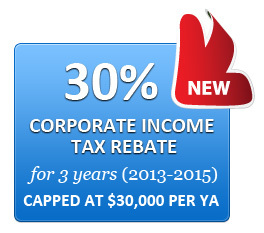 In addition to the Startup Tax Exemption (SUTE), the calculator automatically incorporates the newly-announced 30% Corporate Tax Rebate into the summation. In essence, it shows that while other measures have been made to compel firms to move up the productivity ladder, Singapore still offers one the lowest effective corporate tax rates in the world, after rebates and tax exemptions are calculated. Further analysis by Rikvin shows that although the Singapore corporate tax rate has remained unchanged since 2010, more enhancements has been introduced to lower the tax burden of Singapore registered firms and startups. “Calculating the estimated payable corporate taxes also helps a firm to understand that the amount of corporate taxes that it stands to pay in YA 2013 will be significantly lower compared to a year ago, due to the rebate announced in this year’s budget statement. In essence, it shows that while other measures have been made to compel firms to move up the productivity ladder, Singapore still offers one the lowest effective corporate tax rates in the world, after rebates and tax exemptions are calculated,” she added. The corporate tax calculator complements Rikvin’s Singapore Personal Income Tax Calculator, which was made available to the public less than 2 months ago. “Please note however, that this tool is intended to provide a general overview of your tax position, at best. You are encouraged to seek professional advice from qualified tax consultants before making any decisions,” added Ms. Lim.